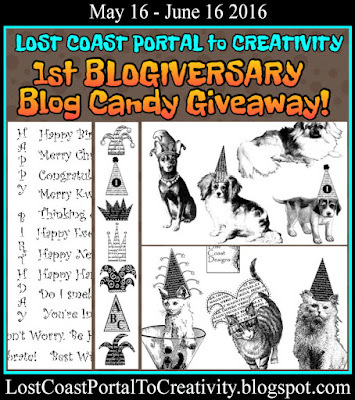 Velvet Paw Creations: LCPtoC 1st Blogiversary - Blog Candy Giveaway! WOW! I can't believe we are celebrating Lost Coast Portal to Creativity's first Birthday already! It seems like only yesterday when I launched our fabulous event and challenge blog for Lost Coast Designs and Carmen's Veranda and gave our fans of both companies a playground to be inspired by and share in. Time sure flies by when you're having lots of fun! We, the LCDesigners, have had a blast bringing you fun events and our monthly challenges over the last year and look forward to what our creative future holds so please continue to follow our adventures, join in the fun and play with us at the Portal and on our new Facebook group! We are giving away a big "Party" bundle of quality Lost Coast Designs rubber stamps to one lucky Portal follower! Now let's celebrate, pop a bottle of bubbly with us! But wait, before you dash off to share our Blog Candy, I've got some news sure to put your hair on end...we're getting spooky over at LCPtoC this week too! 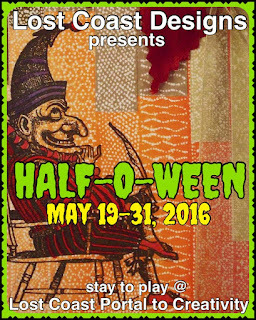 Starting May 19 we are celebrating Half-O-Ween aka Halloween in May every 2nd day until May 31st! Join us and get your scare on!